Floor plans for proposed homeless facilities unveiled. Jill Jones of AJC Architects describes the floor plan for a proposed homeless shelter. 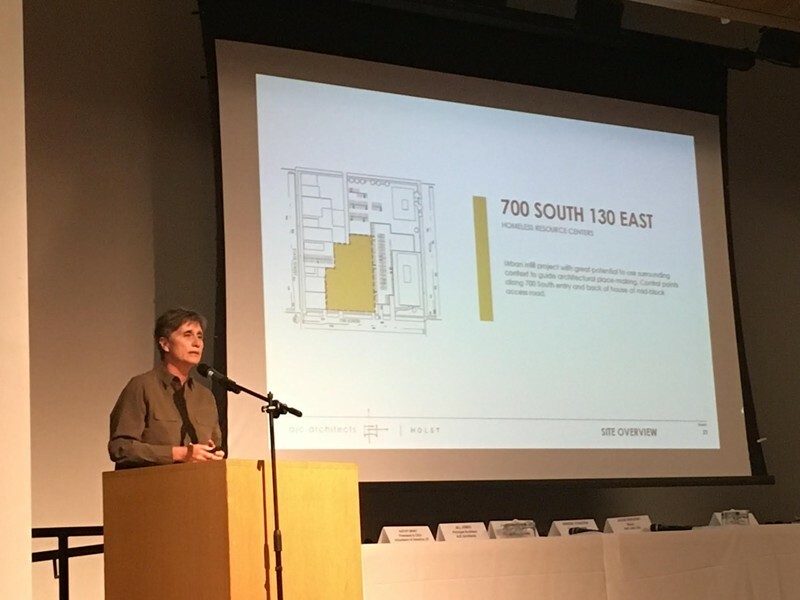 Not without controversy, Jill Jones, the principal architect at AJC Architects, publicly unveiled the initial floor plans for two proposed Salt Lake City homeless shelters on Tuesday night. A heated topic, the new resource centers have been designed to minimize disturbances to the neighborhoods and keep homeless folks safe, she said at a forum Tuesday night at the Leonardo. The term “resource center” is deliberate, Jones pointed out, because the facilities aren’t merely shelters. But, she added, the centers will have a thorough intake process as well as services available and on-site. “The intent is once you’re in the facility, you’ll have many of the resources available to get back on your feet,” she said. 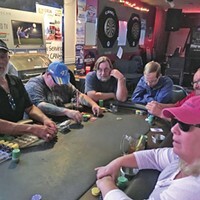 Since the new homeless centers were announced last December, neighbors have been concerned about shrinking property value, rampant crime and dwindling customers coming through the doors of their nearby businesses. Tuesday night was no exception. In an emotional appeal, Michelle Goldberg, owner of Diggity Dog Resort, scolded the panel—which included Salt Lake City Mayor Jackie Biskupski, Police Chief Mike Brown, Shelter the Homeless Executive Director Janell Fluckiger and others—for not informing her that the front door to the shelter was right across the street. Goldberg said she was never informed that the front door to the shelter is going to be on Paramount Avenue, directly across from her business. She found out through a Salt Lake Tribune reporter, asking her for comment earlier that day. “You want to talk about trauma-informed design? I’m traumatized,” she said. Apologizing, Biskupski committed to opening a dialogue with the business owner. According to Jones, a mailer went out three weeks prior, so she wasn’t sure why Diggity Dog didn’t receive the notification. The mayor also said the city researched property values around other resource centers, and came away with the assessment is that the values had not decreased. Chief Brown assured Goldberg that safety is a priority—for both individuals who will be inside the shelters and those in the businesses and homes surrounding the facilities. City Councilman Andrew Johnston said the conditional-use permit places a hard cap on the number of occupants. In this case, the shelter will not be allowed to house more than 200 people. He said the city is investing money into the area to ensure it improves. The two-story buildings will be constructed with common areas, a computer lab, charging stations, a place to receive mail, classrooms, a secure courtyard and places to store personal belongings. Vitally, Jones said, the new shelters will have office rooms for case managers and service providers, such as the Fourth Street Clinics mobile unit. “We want the lower-level to be very much pedestrian scale with a humane entry,” Jones said, which she described as one constructed with soft, welcoming materials and ample lighting and visibility. Tuesday’s forum was the first in a series of public events this week. 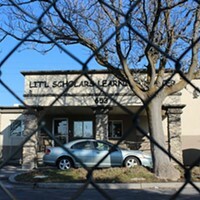 An open house will be held from 4 p.m.-6 p.m. Wednesday at the proposed site on 131 E. 700 South. Another is scheduled from 1 p.m.-3 p.m. Thursday for homeless folks at St. Vincent de Paul at 437 W. 200 South. 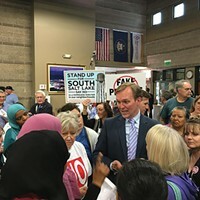 The final open house will be at 4 p.m.-6 p.m. Thursday at the proposed site at 275 W. High Ave.
Salt Lake County aims, struggles to learn from SLC's homeless facilities debacle.